It began inauspiciously with a martyred priest. Preempting a Roman fertility festival, it grew in popularity, propelled itself through medieval chivalric poetry and sing-songy Victorian verse, and found its modern expression in a seemingly endless wave of candy-coated Hallmark joy. “It” is Valentine’s Day, of course. Love it or hate it, you certainly can’t ignore it. Take a break from the teeming card shop shelves this February for a peek into how other cultures celebrate Valentine’s Day. 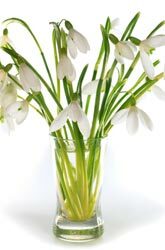 Danish lovers celebrate Fjortende Februar by sending snowdrops, white flowers, to each other. Another clever custom is the sending of love poems called gaekkebrev. In this tradition, the sender pens a short, often amusing poem to his beloved, signing the letter with dots instead of a name. If the recipient can guess the identity of the sender, she will be rewarded by him with an Easter egg in the coming spring. Valentine’s Day was slow to catch on in Japan, but fifty years after the first Valentine’s Day chocolate sale in Tokyo chocolate has become a billion dollar holiday industry. Who’s buying up all the chocolate? Not Japanese men, surprisingly—the men don’t spend so much as a single yen on their sweethearts on February 14th. Instead, women buy chocolates for the men in their life. Women then wait a month until March 14th, Japan’s White Day, to receive reciprocation—sometimes in the form of chocolates given back to them by their sweethearts, sometimes in the form of handbags and jewelry. El Día del Amor y la Amistad is celebrated across Mexico in much the same way it is celebrated in the U.S., with flowers, chocolates and stuffed animals being popular gift items—but, just as the title of the day implies (amistad means friendship), it is also a day to remember friends. One once-popular Valentine’s Day custom is that of la serenata, in which a young lover hires a mariachi band to serenade his beloved beneath her window late at night. This passionate and bold declaration often wakes up the whole household, but certainly makes clear the young man’s amorous intentions! Though Romanians have more recently begun celebrating the traditional Western Valentine’s Day, it is predated by their Dragobete festival, a folk holiday that takes place on February 24th. The festival’s namesake is the Romanian counterpart to Cupid, an embodiment of pure love. Known as the day on which birds are betrothed, it marks the transition into spring. Boys and girls pick snowdrops on this day for their sweethearts, and in some places a tradition of stepping over a partner’s feet is common—it is said that the partner who steps over his beloved’s foot will have supremacy in the relationship. The Welsh Dydd Santes Dwynwen on January 25thcommemorates a Celtic patron saint of lovers. According to legend, the girl Dwynwen renounced marriage and became a nun following romantic disappointment, but not without first having implored God to look favorably upon all lovers. Welsh men carve elaborate love spoons from wood as tokens of affection, and some adventurous young pilgrims craving the assurance of a romantic “happily ever after” may still visit the holy well in Llanddwyn, site of Dwynwen’s church. Sepandarmazgan, a holiday commemorating both love and the earth, goes back to Zoroastrian tradition, though it is not so commonly celebrated today. It is the very rough equivalent of Valentine’s Day and held at around the same time, though for different reasons. On this feast day, women were acclaimed by sitting at thrones and being waited on by men, who thereby learned deference for women but also for their mother earth; in fact, sepandarmaz signifies “earth,” among other things. Whether your plans for Valentine’s Day are grand, like la serenata, or humble, like the homemade gaekkebrev, take some time to recognize those close to your heart this February 14th. How we observe it across the world may vary, but if anything, the variety of these festivals proves that love transcends place and culture.